Make quick and easy boiled eggs in the microwave! 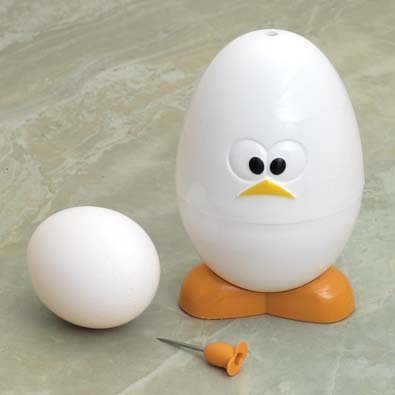 Twist the top of Eggy to open, add water, place your egg inside and secure shut. Before cooking, stick the included pin in hole on top of Eggy to pierce the shell. Microwave on high 3 - 5 minutes for soft to hard boiled. Includes boiler, piercing pin and instructions. 4-1/4" tall x 2-3/4" diameter.